Salted egg and pasta. The combination is unheard of. When I saw this on the menu of Ombu Modern Filipino Restaurant, the adventurous side of me took over. After tasting it, my palate came to realize it works, surprisingly! 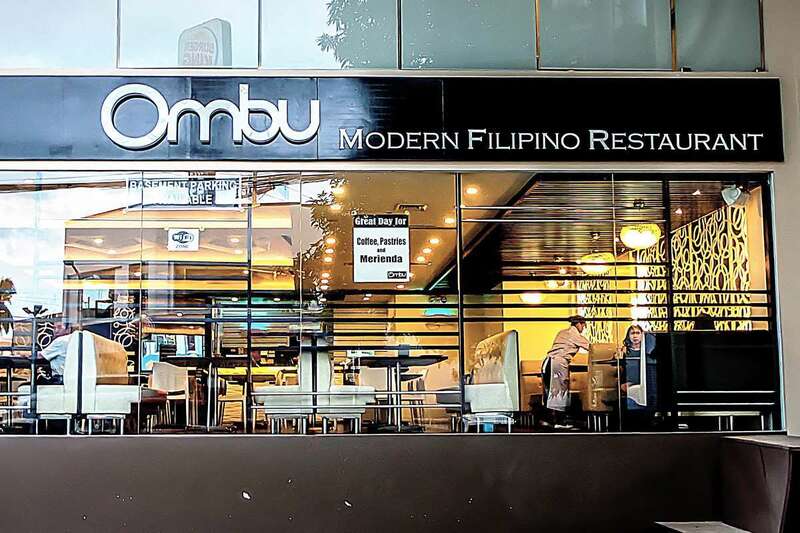 Ombu Modern Filipino Restaurant is located along Mother Ignacia Street corner Timog Avenue in Quezon City. It’s a cozy restaurant serving Filipino dishes with modern twists. 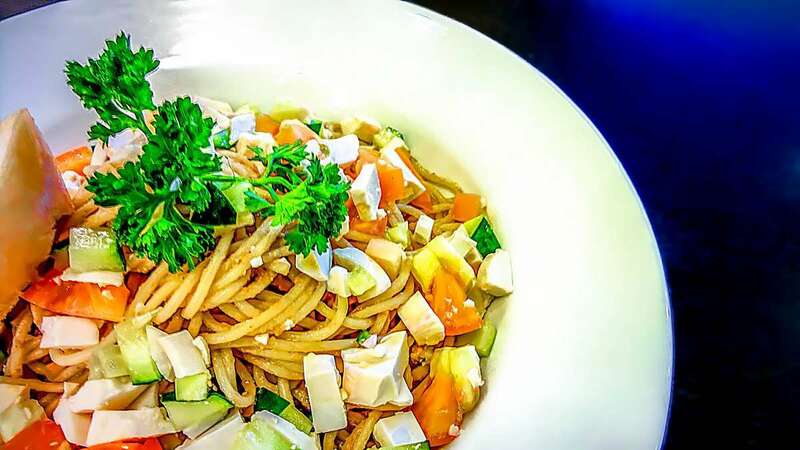 You have to try their Salted Egg Spaghettini. The yolks from the salted eggs wrap the pasta with flavor. It tasted rich and light at the same time. The chopped cucumber and tomatoes gave this a refreshing feel. The chopped egg whites from the salted egg gave this dish the added salty taste. I loved the pasta with the yolks so much that I had to separate the tomatoes, cucumbers, and egg whites, so I can just savor the tasty noodles. I ate the tomatoes, cucumbers, and egg whites after. 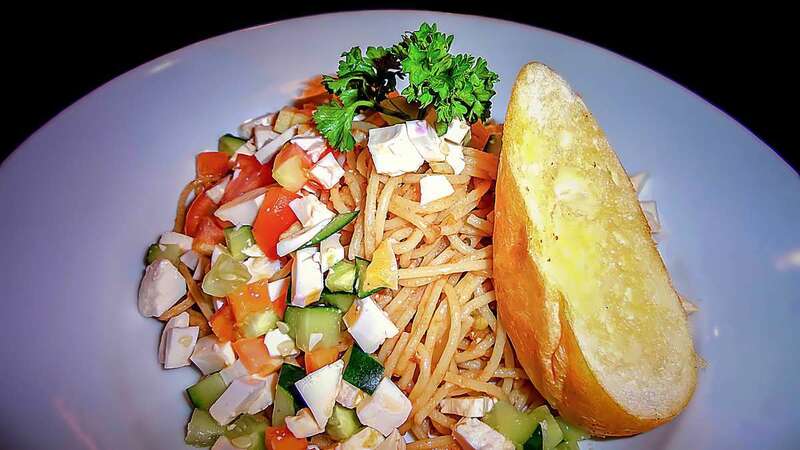 The Salted Egg Spaghettini, for me, is a mix of Italian and Filipino. I grew up enjoying salted eggs and tomatoes — something, I think, is common with many Filipinos. Pasta is often associated with Italian cuisine. You combine them and you get this interesting fusion. Another winner here is their Tinapa Croquette. I love the flavorful smoked fish we call tinapa. I eat this with garlic rice and egg. Now here comes Tinapa Croquette. 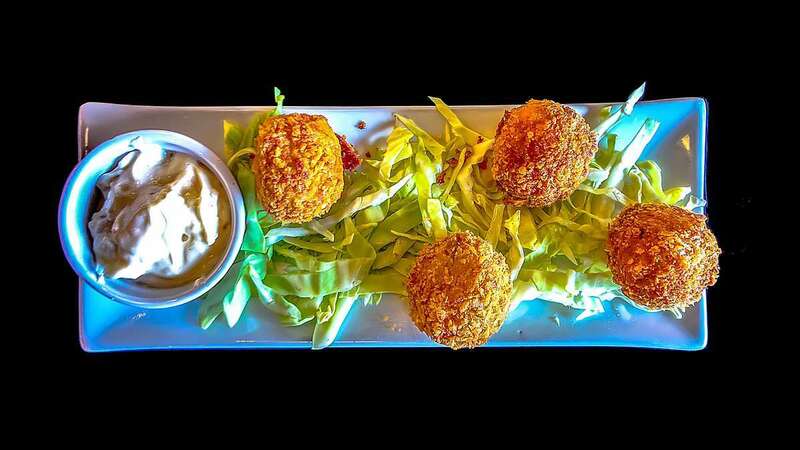 A croquette is usually mashed potatoes, ground meat, and cheese with herbs, coated in breadcrumbs, and then fried. The Tinapa Croquette, of course, makes use of the smoked fish as meat and the tinapa’s taste is what gives this a two thumbs up. Ombu also has another twist to a traditional Filipino dish. 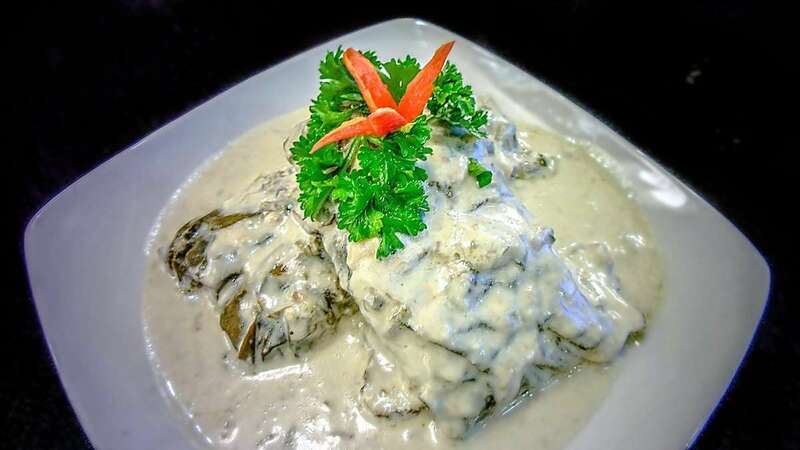 Laing is taro leaves and pork cooked in spicy coconut milk. Ombu serves Seafood Mix Laing which has taro leaves, shrimps, and crab meat, all cooked in coconut milk. If you like tempura, Ombu has a different version. 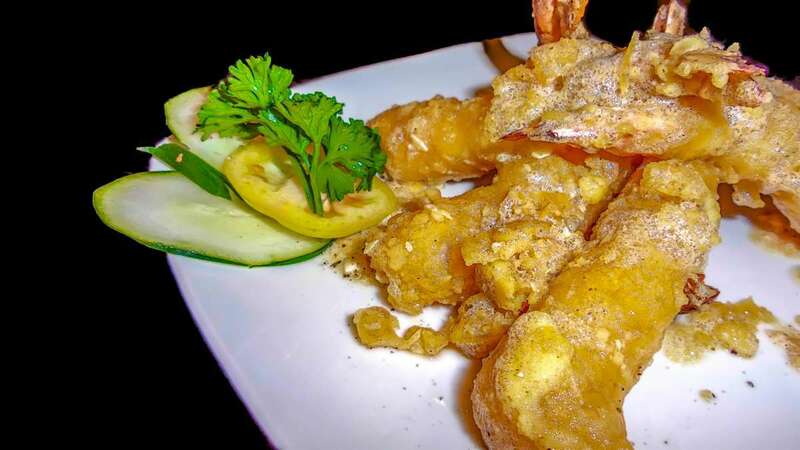 The Salted Egg Tempura is coated in butter and salted egg yolk. It still tastes like tempura but richer because of the butter, and has a bit of a grainy texture because of the salted egg yolks. For dessert, they have Banana Flambe Ala Mode. 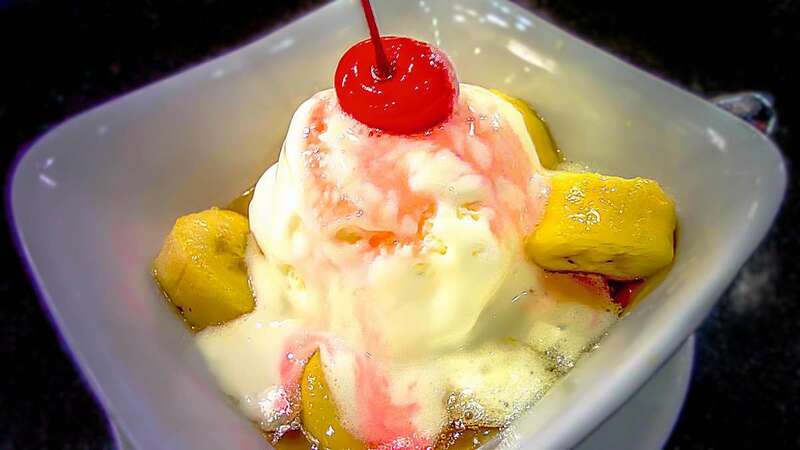 That’s sweet bananas, syrup, liquor, briefly flamed, and served with a scoop of ice cream.